A remote-triggered camera captures a male McKay’s Bunting blasting out of a nest cavity after feeding his three chicks on St. Matthew Island. Photo by Andy Johnson. Tricolored Blackbird by Nigel Voaden/Macaulay Library. 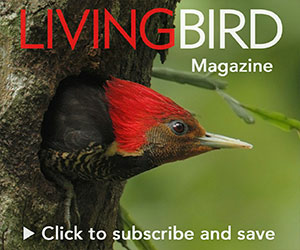 Bringing Back the Red-cockaded Woodpecker: Are Prescribed Fire and Artificial Nests Enough? Red-cockaded Woodpecker by Patrick J. Blake/Macaulay Library. American Kestrel by Matt Davis/Macaulay Library. Blue-headed Vireo by David Leonard/Macaulay Library; forest by Jason Koski.